Dr. Jack Langelaan’s talk at the fifth annual Electric Aircraft Symposium was one of at least two to use the term, “heuristic,” and sent this writer scrambling for the dictionary. His presence in Santa Rosa, four months ahead of his return with the Green Flight Challenge winning Pipistrel G4, showed at least one of the facets to the planning that would make the G4 victorious. Careful flight planning, as any flying instructor will gladly inform you, is a prerequisite to getting the greatest efficiency out of an airplane. Historically, much flight planning involved following mapped-out air routes and flying at prescribed altitudes, at least in controlled airspace. Recent efforts to release those constraints have come about through concepts described by journalist James Fallows in his Atlantic magazine reporting and in his book Free Flight: Inventing the Future of Air Travel. Fallows wrote the book 11 years ago, looking at new technology and approaches such as the Cirrus SR20, the Eclipse “commuter” jet, and GPS-based navigation that would free air travel from staying within the lines while being able to exploit changing weather and wind patterns. The quickly coming age of unmanned aerial vehicles in civilian hands is forcing necessary changes in air traffic control, because future flight will increasingly involve these autonomous vehicles interacting with scheduled airliners and general aviation. Maintaining sequencing and separation under such fluid circumstances will become more challenging. The promise of “free flight” is a grand one, though. 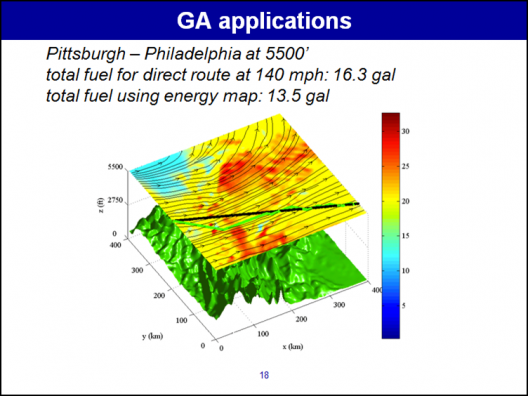 In the Green Flight Challenge, Jack Langelaan, Assistant Professor of Aerospace Engineering at The Pennsylvania State University, was able to apply his experience with nuanced flight, as shown in his EAS presentation, to that of determining speed, power settings, and other elements to take the greatest advantage of winds aloft during the 200 mile run around the GFC course. This led to analyses that Ivo Boscarol, Pipistrel’s head, said were within three percent or better of the actual flight – and the actual flight often exceeded predictions. The ability to gain the greatest efficiency from an aerial vehicle paid off for Langelaan’s team, and is a factor regardless of aircraft size. In his talk, “Autonomous Soaring Flight,” Dr. Langelaan focused on small, hand-launched “aerosondes,” robotic craft that have even flown across the Atlantic Ocean without human intervention. 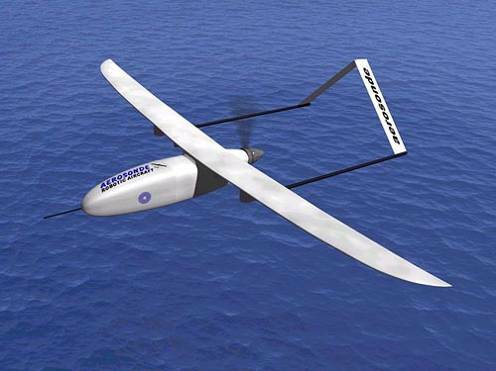 According to Barnard Microsystems, supplier of small UAVs and systems, credit goes to Aerosonde for an amazing flight. “The first UA to cross the Atlantic was the Aerosonde Mark I “Laima” flying from Bell Cross Airport in the USA to the DERA Benbecula Range in the Outer Hebrides, covering 3,270 [kilometers] (2.027.4 miles) in 26 hours 45 minutes at an altitude of 1,680 meters (5,512 feet), using only 5.6 kilograms (12.32 pounds or about two gallons) of fuel.” The 2.9 meter (9.5 feet) wingspan craft was powered by a 25cc engine, could carry a 2.5 kg (5.5 pound) payload, and exceeded its maximum design endurance of 25 hours. Airplanes and birds exploit these vertical air motions to soar, and birds have for years used dynamic soaring to stay aloft on velocity gradients or shear layers that tend to be more horizontal and close to the ground (or in the case of the albatross and other soaring sea birds – water). Forecasts at the immediate size level and within the time frames of such dynamic events are generally not available, since most weather forecasting is done at scales ranging from an alpha scale for hurricanes that may cover 200 to 2,000 kilometers and last several days, down to gamma scale event such as thunderstorms and large tornadoes that cover two to 20 kilometers and last as little as 30 minutes. A UAV flying into such events must assess and take action based on local information, so these craft are instrumented to provide navigation, terrain, and meteorological input. They “learn” to assess new circumstances and can “determine” the best course of action. In Dr. Langelaan’s research, hand-launched UAVs explored how most efficiently to fly a mission that included traveling to a distant point, bridging a large terrain gap that did not permit ridge soaring, and using the least energy to accomplish the mission. The autonomous vehicle constantly re-assesses how much it has “cost” so far and estimates the “cost to go” to determine a net cost. This in turn requires constant updates of the current weather. The energy map derived from these calculations accommodates slight heading or altitude changes, subtle changes in power settings, and gives a more efficient way for even general aviation airplanes to move around the sky. These small differences made all the difference in winning the Green Flight Challenge and are a reflection of how university and organization research can be applied to great benefit in even daily flight. I highly recommend reading the story of Laima’s transatlantic flight as documented by Dr. McGeer (found via above link, at http://www.aerovelco.com/papers/LaimaStory.pdf). Since then, unmanned aircraft technology has blossomed in myriad directions and forms. The on-board intelligence of current designs is astounding. My hat is off to the CAFE Team for helping cross-pollinate the many fields of aviation to the benefit of all.